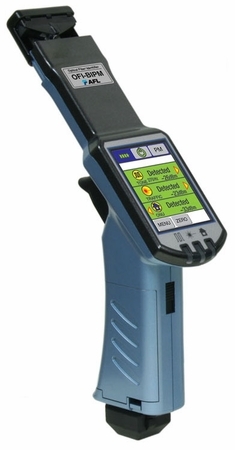 The OFI-BIPM is an easy to use tool that determine if a fiber is live, the transmission direction and the relative core power on standard and bend-insensitive single-mode fibers. Its positive stop plunger mechanism provides the right pressure to assure proper detection while keeping loss to a minimum. The design assures traffic will not be interrupted and fibers will not be damaged. The OFI–BIPM model provides an integrated optical power meter for verification of power levels during installation or troubleshooting activities. The universal head of these OFI’s eliminates the need to change adapter heads for jacketed, coated or ribbon fibers, making them extremely easy to use in the field. The touchscreen features provide simple to follow setup and clear to read results. OFI-BIPM Optical Fiber Identifiers are warranted against defective material and workmanship for a period of one year from the date of delivery to the end user.